This recipe is long past due. I meant to post pumpkin pancakes last year and didn’t get around to it so I’ve been holding out for this fall and just couldn’t wait any longer. 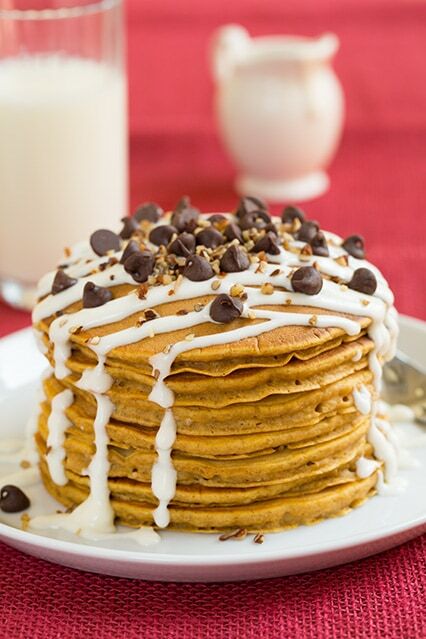 These pancakes are like pumpkin pie covered with Heavenly goodness. 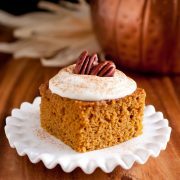 Pumpkin pie in breakfast form, oh yes! 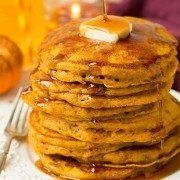 I loaded these with pumpkin pie spices along with just the right amount of pumpkin and brown sugar, then couldn’t choose between toppings so I decided to post both and they were both meant to be with these pumpkin-y pancakes. 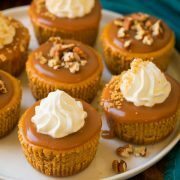 The one covered with cream cheese syrup and optional chocolate chips and pecans is a complete reminder of one of my favorite Fall cupcakes and the other is my idea of the perfect fall breakfast, with it’s pecan-pumpkin combo and of course the addition of browned butter (because who can resist? If you are going to make butter pecan syrup you may as well brown it first, right?). These pancakes make the perfect special occasion breakfast or they could definitely pass for an enticing dessert. But trust me, your not going to want a short stack, you’ll want them piled high and covered with a generous helping of the velvety rich syrup or tangy sweet glaze. Enjoy! Yes, I definitely over-whipped my cream. It’s what happens when you aren’t paying attention :). 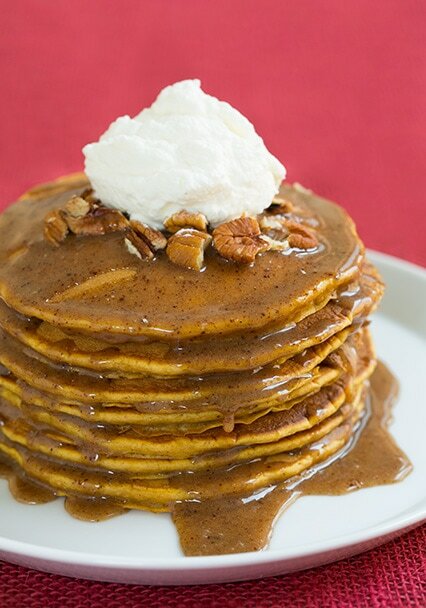 Perfectly pumpkin flavored pancakes finished with a sweet and rich browned butter pecan syrup. Makes about 16 pancakes. Preheat an electric griddle to 350 degrees. In a mixing bowl, whisk together flour, baking powder, baking soda, salt, cinnamon, nutmeg, ginger and cloves for 30 seconds. Create a well in dry mixture and set aside. In a separate mixing bowl, blend together pumpkin, brown sugar and oil. Stir in eggs and vanilla, than mix in milk. Pour wet mixture into well in dry mixture and whisk just until combined (batter should be slightly lumpy, don't over mix). Pour about 1/4 cup batter onto griddle, buttering griddle first if necessary. Cook until bubbles begin to appear on surface and bottom is golden brown, then flip and cook opposite side until golden brown. Serve warm with syrup and toppings of choice. Brown butter in a small saucepan and cool slightly. Pulse toasted pecans in a food processor until they become a paste like consistency, then add syrup and pulse until well pureed. Add in butter and pulse several seconds longer. Serve warm. Store in an airtight container in refrigerator. In a mixing bowl, using an electric hand mixer set on medium speed, blend together cream cheese and butter until well combined and fluffy, about 2 minutes. Add in remaining ingredients and mix about 1 minute until slightly fluffy, adding additional milk to thin if desired. Store in an airtight container in refrigerator.